The Elite 10: Our Favorite Bicycle Races in America! For kids, learning to ride a bike is one of those rites of passage. It's been that way since the invention in the early 1800s (although early models, with that giant front wheel, were way more challenging to navigate). Since those early days, bicycles have evolved, from your basic two-wheeler to sophisticated 10-speeds, mountain bikes and more. Naturally, anything with two wheels inspires speed; thus, bike racing became an organized sport around 1868. By the 1896 Olympics, a 12-hour bike race was on the menu. Today, there are nearly 67 million people who ride a bike. Some may just hop on to nab some groceries; others are serious racing competitors. The Tour de France is perhaps the best-known bicycle race. It was first held in 1903, and is the oldest of three European "tours" (the others being held in Italy and Spain). This one winds through the Alps and Pyrenees, and ends when the first rider crosses the finish line at the Champs. But if you can't make it to Europe, check out ten pretty cool races here in the U.S.
Whiteface Mountain is New York's 5th highest peak. So why not peddle uphill? For 11 miles? Well, at least the scenic Veteran's Memorial Highway will take your mind off your screaming calves and quadriceps. Once you reach the top, you'll get amazing views of the Adirondacks, New England and even Montreal. This seven-day mountain bike stage race in central PA winds through state forests marked by challenging climbs and descents that require serious skill.Those who've done it say that riding for 3 or 4 hours on each day is enough to finish. For those who want something extreme, this epic ride should fit the bill. It's a 200-mile endurance challenge over dirt and gravel roads, and is not for the weak-hearted. Or "-kneed." 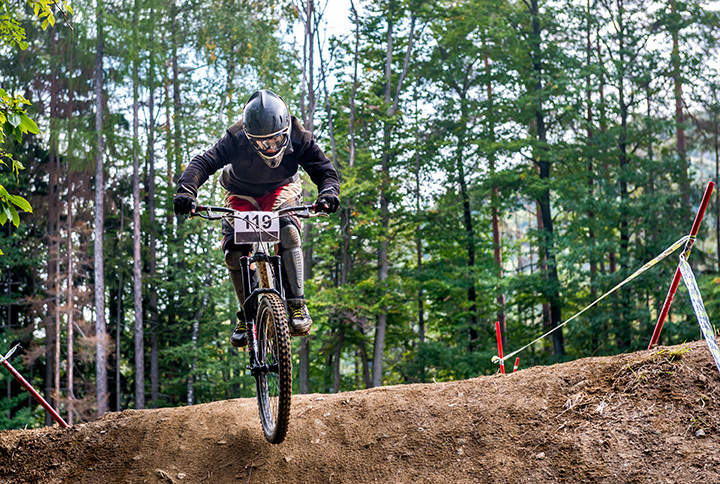 The altitude of this mountain bike race is a major factor: from 9,200 to almost 13,000 feet. Only about 65% of the 1,500 entrants finish. Still, the challenge is such that riders who want in have to hope they win in the lottery system - it's sold out every year. The 206-mile ride starts before dawn in Utah, and winds through parts of Idaho until ending in Wyoming. The challenging (yet scenic) ride takes you through three mountain passes and to elevations of 7,500 feet. Thousands of cyclists gather each year for this one. It's open to all levels, from kids to pros. Adults can opt for routes ranging from 38 miles up to 107 miles, winding through the Sonoran Desert. Cyclists compete against a 300-ton steam engine built in 1923. It's 53 grueling miles across the AZ landscape. The engine runs along the Grand Canyon Railway tracks, while the cyclists on the highway push to best its time to the finish. OK, so maybe it's not as gritty and competitive as some other races, but it does serious good. The annual event raises money for cancer research. Plus, you get to ride through some amazing scenery around Lake Tahoe. Entrants can opt for a 35-, 72-, or 100-mile trek. It's the final stage of the Tour de France-like "Amgen Tour of California." This ride covers 105 miles and runs through surf towns like Ventura. At the summit, riders take in the view from 3,300 feet. It's open to amateurs and pros alike. Hundreds of cyclists race through the city streets, hoping to nab the homemade trophy (made from welded bike parts) that's passed down from year. The rules? There are pretty much none. This event has been described as 'Road Warrior on steroids."